Daniel Gonzalez a.k.a. Play Picasso talks movie score inspiration, versatility, and how Meek Mill saved him. Before Play Picasso became one of Tory Lanez's go-to producers, Daniel Gonzalez was a high school dropout with a GED. He was born in Cuba and raised in Miami, stringing together odd jobs in fast food restaurants and on construction sites. 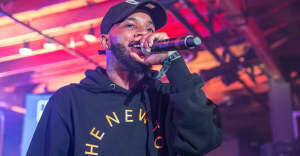 Today, his music is a cornerstone of Lanez's major label debut I Told You, appearing on ten of the album's fourteen songs, and on all of its skits. But what you hear on this project is just a sampling of the Play Picasso aesthetic, he told The FADER over email. "This is what we felt the people wanted to hear from us," he writes. "It's easy to get put in a category or style but it really doesn't matter, if you want to separate yourself you will by your work. I'm just blessed to be in a situation where I can explore versatility." In the wake of the release of I Told You, The FADER spoke with Play Picasso about his origins, how he and Tory connected, and how Meek Mill commissioned a beat from him when he was at his lowest point. I started making beats at 14 and actually producing/songwriting two to three years after that, when I went all in. My mom had me in piano classes as a kid for about a year which still helps me to this day. How did you and Tory Lanez meet? Tory was in Miami shooting his "Hate Me On The Low" video at the studio I work at. In between it all we met and I played him some beats. He said "They're cool, but it's not what I'm looking for right now. I'm looking for a specific sound." A couple of days later he called and told me that he was working on an idea of a tape sampling the 90's classics we grew up to. We connected on this conversation and decided to go at producing some records together. We went in and that ended up being Chixtape 2. Did you produce any of the music on the skits? Were you inspired by film scores at all? I was. We did a lot of it on the tour bus as we came up with the sound effects and recorded the voices. Film sounds are a huge part part of my inspiration generally, especially Hans Zimmer's stuff. I have times where I'm working on live music like neo-soul or rock/country, or it can be hard bass heavy programmed records. It depends on what I've been listening to. You produced "Lord Knows," the opening track on Meek Mill's Dreams Worth More Than Money. How did that track come about? This was HUGE. My first paid placement was this record. I was in a really bad time in my life at that point, and I sacrificed everything to be in the studio every single moment I had. At this point, I didn't have a computer to work on, since I sold the one I had to pay bills. I stayed over my moms one night and without enough change to take the bus to leave, I installed my Fruity Loops studio software on her computer so I wouldn't stop working. I ended up making the "Lord Knows" beat that night with some old iPod headphones she had and showed it to Tory a few days after. We recorded to it but it got thrown in the vault. Kellz called me one day and said to send him the beat with Tory's hook, and that Meek was gonna take it and put it on his album. God is always looking out even when it all looks down.